Fortune telling fish have been around for a really long time! Enjoy the ongoing tradition by placing one fish in the the palm of your hand and watch for the results! The results are as follows: Moving Head - Jealousy Moving Tail - Happy Moving Head And Tail - In Love Curling Sides - Fickle Turns Over - Silly Motionless - Sleeping Fish Curls Up Entirely - Passionate Reusuable and fun! 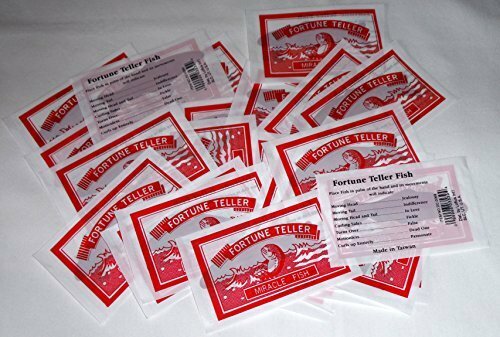 Fortune telling miracle fish come in a bulk pack of 144. Fun for all ages to play with this cool fish fortune game. 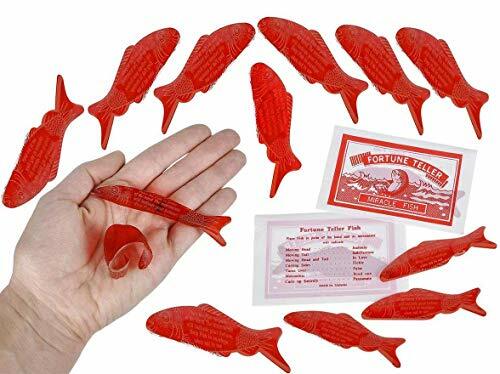 Place the thin red plastic fish in your hand your body heat will make it curl, flip, wiggle. The fish's movements will indicate your mood/romantic state Check the envelope to find out the exact meaning of the fish's movements, ex. Moving head is jealousy, moving tail is indifference, etc. 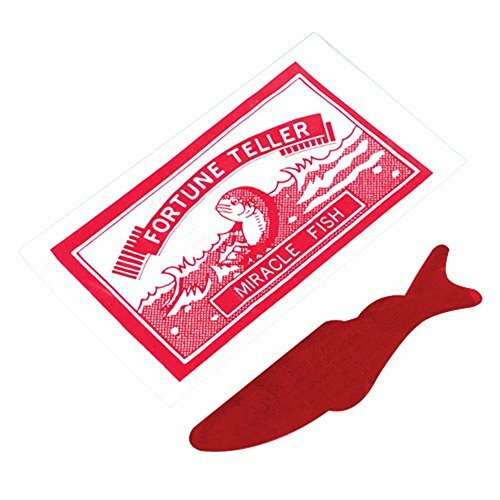 These fortune fish are perfect for prank or gag gifts, carnival games, goodie bags, classroom prizes, gifts, Valentines day, and much more. Fortune Teller Fish FUN FOR THE WHOLE FAMILY THIS DEAL IS FOR 10 FORTUNE TELLING FISH Place the fish in the palm of the hand and its movements will indicate... Moving Head, Jealousy Moving Tail, Indifference Moving Head and Tail, In Love Curling Sides, Fickle Turns Over, False Motionless, Dead One Curls Up, Entirely Passionate Question: How Does the Fortune Teller Miracle Fish Work? 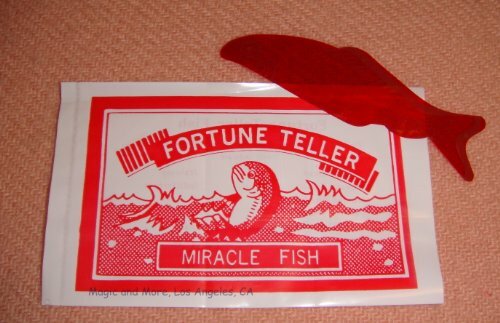 If you place the very thin Fortune Teller Miracle Fish in your hand it will bend and wiggle. You can decipher the movements of the fish to predict your future. The movements of the fish are a result of the chemical composition of the fish and heat from your hand. 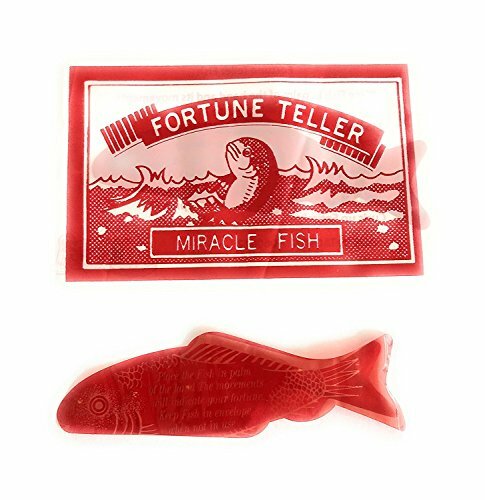 Answer: The Fortune Teller Miracle Fish is a novelty item. 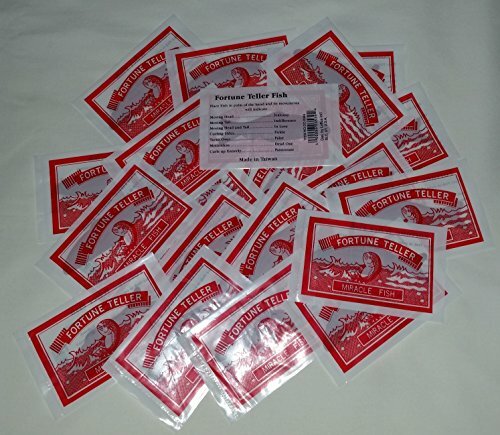 It is a thin red fish shape type of plastic that will move when placed on your hand. This is a novelty item and should not be taken seriously, it is for entertainment only. Instructions are plainly printed on the Miracle Fish Fortune Teller package. WARNING: Not recommended for children under 5 years old. 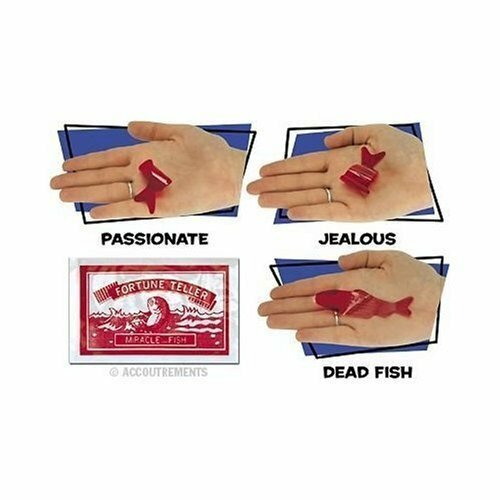 Place this paper-thin red plastic fish in the palm of your hand and its movements will indicate your romantic state. No one knows romance like fish! Use as a unique and fun give-a-way. 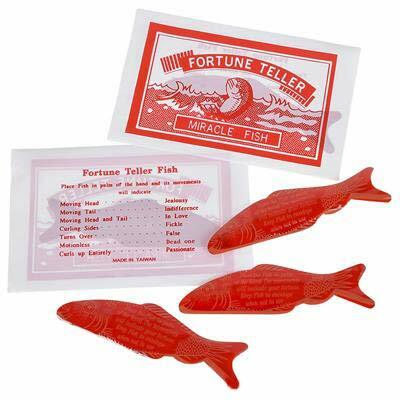 Offer the Fortune Teller Fish to kids at birthday parties and to adults at cocktail receptions. Many adults recall these fish from their own childhood days and it's amusing to see grown adults toying with them. The fish is actually made of a space-age polymer plastic that is heat sensitive. When placed flat in a person's hand, their own body heat will cause the fish to wiggle and move like magic! DON'T TELL THEM THIS! Place the fish in another person's hand and explain that the fish has special powers and that the way that it twitches will predict their future. So who has tried one of these before let me know in the comments below Copyright Disclaimer Under Section 107 of the Copyright Act 1976, allowance is made for "fair use" for purposes such as criticism, comment, news reporting, teaching, scholarship, and research. Fair use is a use permitted by copyright statute that might otherwise be infringing. Non-profit, educational or personal use tips the balance in favor of fair use."